As a mental health professional, I was a bit guarded about attending a HeartThread session with Raphael. 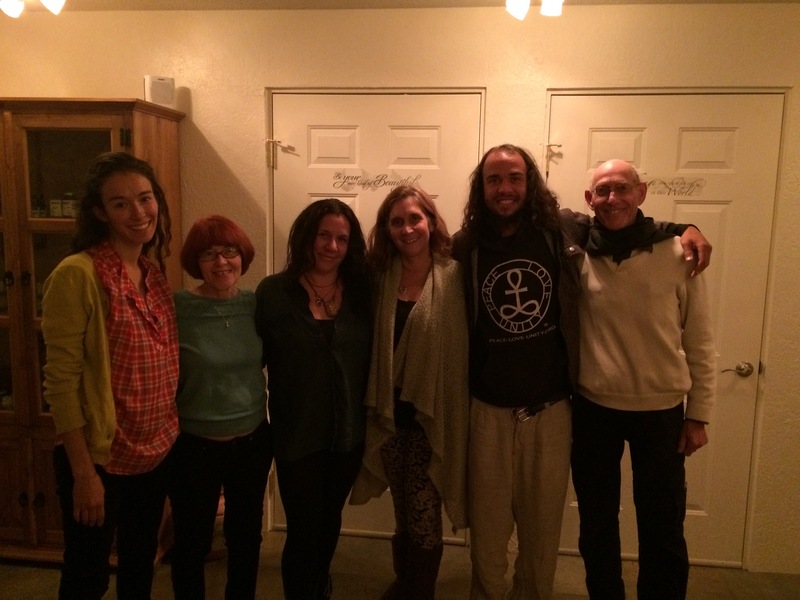 While staying at Sunrise Springs Resort in August of 2016, my husband and I thought we would try something new together, and I’m very happy we attended a HeartThread session with Raphael. He truly has a unique gift, and provided us both with insight, compassion, and guidance that really did fit for us, given where we were in our lives. I would definitely recommend this experience to anyone open to inviting inspiration, guidance, and healing. Remember to record the session, if you are able. “I am still processing the information you gave me at Sunrise Springs last week. It was exactly what I needed to hear and has helped to keep me grounded. I only wish there had been an opportunity to record or write down all the information. It has been hard to reenter the phrenetic world of Los Angeles after such a spiritual experience. 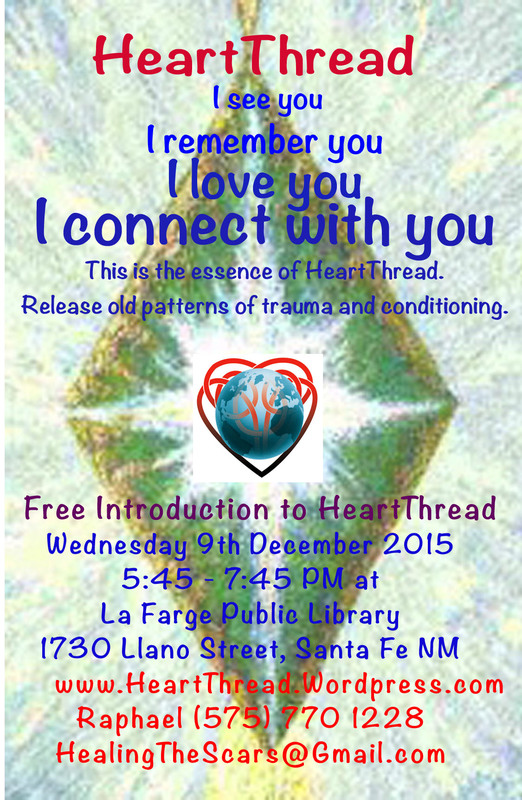 I have had two wonderful HeartThread healings with Lisa Farrand. I have felt so much shifting and continue to. There was a release in my TMJ and ears, and pain in throat was gone. I have felt more motivated and positive/connected to my true self. So truly thankful to Lisa and the incredible healer that she is, and her beautiful heart she shares with all! blessings, J. O.
Congratulations to the latest graduates who are now amazing HeartThread facilitators. What a powerful training experience for all of us. If you would like to find a minimum of 6 people who would like to receive the training, Karen or Raphael will gladly lead a practitioner training weekend. Please be in touch and call us to talk. a graduate of the first Santa Fe HT training. 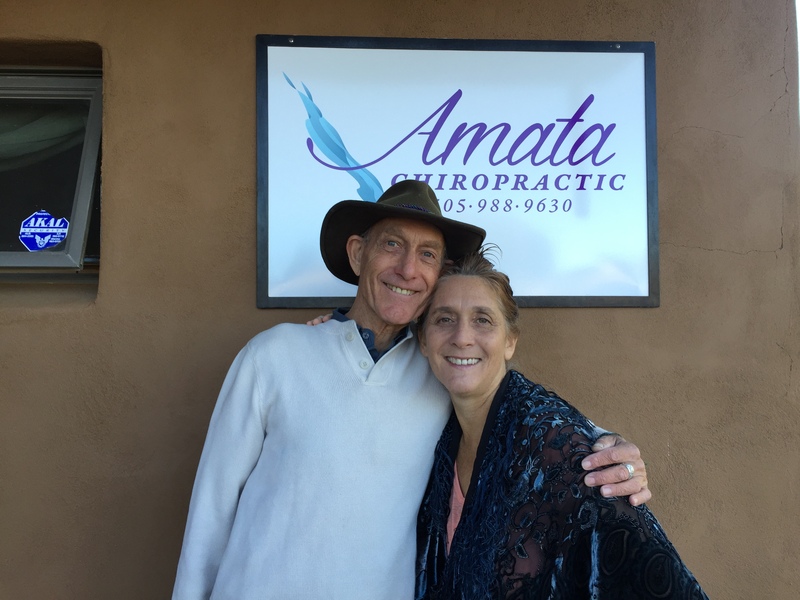 We are extremely grateful to Amata for allowing us to meet at her office and providing such an enriching environment in which to teach and practice. Please support her powerful healing practice and yourself by booking a consultation. Margarita: I really liked that this class was experiential – hands on! Not only was I able to experience HeartThread from the instructor, I was able to practice the technique he taught on others. I feel calm and healed. I am grateful to have been given this gift to heal myself and others! Jacquelyn: This healing work felt like receiving and giving at the same time. Deeper, deeper to the core it went filling my being. Andrea: I had no idea what I was in for when I agreed to come today. I have never done anything like this, but boy, I was presently (pleasantly) surprised! I hope I can find a way to integrate this into my life on a regular basis! Lara: Sometimes you just need to hear important lessons and messages from the outside. Today there were four voices, four filters, passing along messages that, inside me, are harder to hear and remember. Ara: I feel very blessed. I feel excited now for my life and now see more connectedly the threads of guidance, love and angelic presence that are giving me the healing to live my life as I reach for the healing within my heart to share with all. I feel expanded and ready to feel, understand and know more of the truth. It is wonderful to honor the precious gift of this heart listening to i and letting the body and shoulders learn to trust and let go, relax and let love in. Thank you. Hope to grow and know further about this! I was disappointed my gap session didn’t fill in this morning, and once again, it turned out to be the ideal situation. My prior client asked to extend her 60 minute massage to 90 minutes while on the table and also said she was interested in the energy work I do. Since I’ve found HeartThread to mesh so easily and beautifully with my particular brand of bodywork, we included it in the last bit of time. Every time I thought we were “done” another piece would come in and I would relay what her body was telling me. I keep things in generalities during Heart Thread and don’t ask for clarification, though of course I’m always pleased to hear the phrases that could apply to just about anything mean the world to the one I’ve just relayed them to. The indescribable sense of compassion and love inherent to this work was strongly present. Familiar as it’s become from entering so often into this space over the last (almost) two years is still close to overwhelming because when not in it the intensity fades. (I swear, if we could bottle this no one would ever feel alone and separate again!) I recognized the magnificence of this amazing human being I was blessed with the opportunity to witness in the moment. I did not realize the intensity of the work for her until after the session. Obviously, I can’t go into any sort of detail, and honestly, the personal details aren’t what I want to convey. The true bliss point for this session was after it was over and this radient supernova of Life and Light told me how the messages relayed to her applied, resonated, and validated to, with, and for her. “Professionalism” be damned, we hugged, both in joyful tears, having been opened and expanded into the reality of Life and Incarnation past the restrictions of plodding existence. It’s nearly 30 minute since she’s stepped out of my office and into her day, her life, her restored knowledge of herself. I’m still nearly shivering with the intensity of the gift I received of being with her as she unfolded one of what is clearly many rebirths in her life. My business is sometimes considered a “service.” All service should be this life-affirming! Words simply cannot convey this feeling, and I know my Heart Thread colleagues (and many others) have felt it or something quite similar. I am currently in such deep gratitude for this work, and honored somehow even deeper than my core to have had the opportunity to learn it. Truly, the time has come to pass this on, to pay it forward! I’m about to post a chat log at my work blog from an online session I did which started out as Heart Thread and, as is typical for me, incorporated other modalities. I clearly recognize words and phrases from sessions I’ve received from several of you, and thank everyone involved (those in bodies, and those not) who contributed in bringing me to this point.